The path trodden by the middle-aged middle classes in Britain, smooth though it may appear to the less privileged, is in reality a peculiarly dangerous one, dogged by its own set of terrors, pitfalls and opportunities for social humiliation. 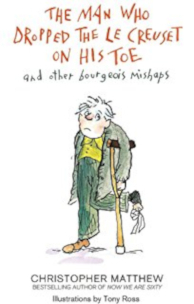 In The Man Who Dropped the Le Creuset on his Toe Christopher Matthew follows up the huge success of Now We Are Sixty with a collection of mordant, witty, cautionary verses on the subject of the British bourgeoisie and its foibles and failings. Not only can expensive, enamelled, cast-iron cookware be very dangerous in the wrong hands, but so too can Pilates, open-air opera in evening dress, weekending in Wales with a pug, gastro-tourism in Tuscany, the mid-life parachute jump as an alternative to physiotherapy, and pushing a trolley in Waitrose. As for the middle-aged Lothario’s quest for a younger, Mark Two model, this can all too often end in ignominy rather than fun and games and feather boas in Cap Ferrat. Sharply observed and gloriously mischievous, The Man Who Dropped the Le Creuset on his Toe gently punctures the pride and sense of entitlement enjoyed by the pesto-loving middle classes. First published by Little Brown (Hachette, UK) in 2013.